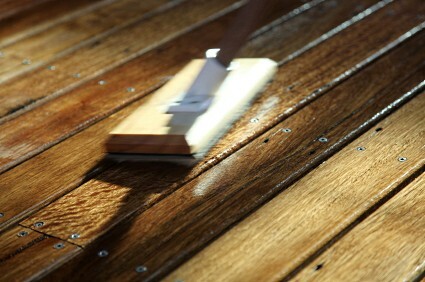 Applying wood sealer to deck floor boards using a staining-pad. While spraying is the fastest way to apply deck stain, for most homeowners, using a roller or lambswool pad is one of the most practical ways to apply deck stain. The process takes longer, but there are some important advantages to using these cheap tools. For one thing, there is no over-spray to control. If you live in a windy climate or don’t want to take the time to mask the siding, cover the bushes and protect other exterior features, you will find that a roller and pad saves you the trouble. Another advantage of applying finishes by hand is usually improved penetration, especially when properly back-brushed. This creates a more protective and evenly colored finish. Rollers and lambswool pads distribute color much more quickly than a brush can, so you’ll finish faster. Use a napped paint roller. It will apply the stain much like the lambswool pad. 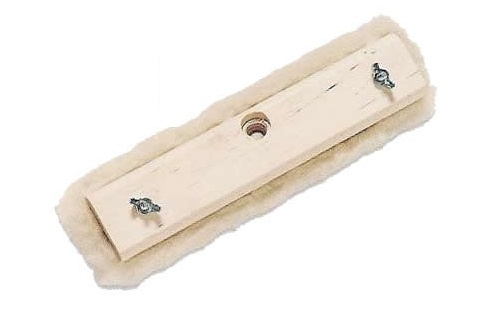 Paint rollers come in widths as narrow as 4-inches, though the standard width is 9 inches. Lamb’s wool pads come in several widths from 6-18″. An extension pole will save your back whether you choose a roller or pad. Pour the stain into a paint tray. This makes it easy to evenly load the roller or pad. Use the ridged section of the tray to wipe of excess stain. Apply the stain to an area two or three boards wide, making sure to maintain a wet edge at all times. This way you don’t end up with overlap lines. When you use a roller, your goal is to refill the roller as soon as you have to apply pressure to get stain to lay down on the surface. Don’t move the roller too fast. This can cause the stain to spatter. Begin the stroke when the roller has just been refilled about six inches away from the wet stain. Then roll toward the wet section. Roll back and forth at a smooth steady pace, refilling the roller as frequently as needed. With a pad, you pull and push the pad back and forth. Always work with the grain for the most even distribution of color. When the pad begins to leave streaks, refill with stain. Keeping a wet edge is vital with a wool pad as well. Always put the pad down approximately six inches in front of the previously finished area, pushing the pad towards the stained section. This encourages a smooth blend instead of heavy puddles in places. Wipe up drips, runs, and splatters as soon as you notice them. If allowed to dry in place, they’ll create visibly dark marks that can only be removed by sanding. You’ll need to use a brush to “cut in” along the house wall, the last board of the deck, and anywhere else a roller or pad can’t easily reach. You’ll also need a brush for cutting in and staining handrails and accessories like planters and benches. 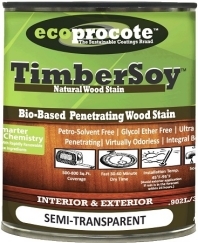 Use the brush to lay down a line of stain 3-4″ wide. Now, overlap the wet edge with the roller or pad. High quality pads distribute color evenly, but rollers leave small areas of concentrated stain, and lesser-quality pads can leave thick bands of dark color. These areas must be smoothed by back-brushing. As soon as you lay down a two or three board wide swath of stain, immediately go over the area with a brush to even out the color and blend in smears and puddles. Speed is very important here, so it’s wise to work with a helper. One person can apply color with a roller, and the second can follow behind to back-brush. Click here to read about the best sequence for staining your wood deck.